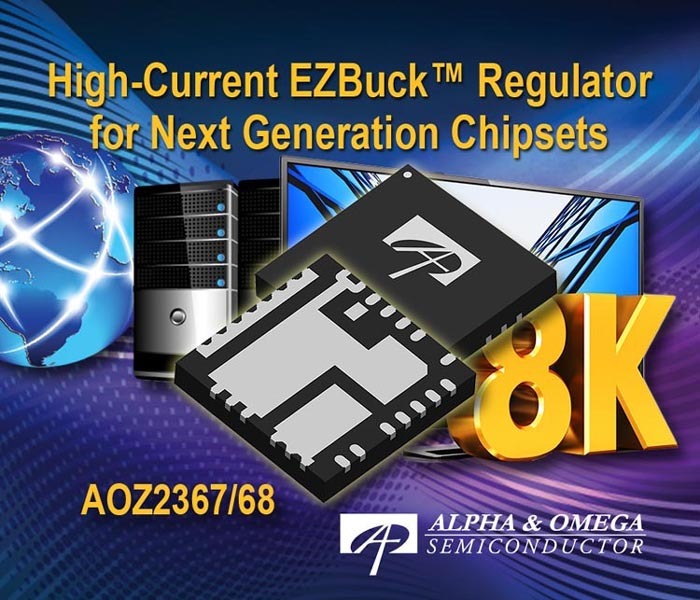 Alpha and Omega Semiconductor (AOS) introduced a new family of EZBuck™ regulators. The first two members of the family are the 20 A, AOZ2367QI and the 25 A, AOZ2368QI. The new devices provide a compact, efficient power converter solution for next-generation chipsets used in high-end TVs, servers, data storage systems, networking and other compact PC systems. Next generation microprocessors and SoCs require more power to do fast-speed calculation as well as to provide more add-on functions for the enhancement of user experiences. Implementing much higher output power in a DC/DC converter often requires the use of several external components such as high current and low turn-on resistance MOSFETs. The 20 A, AOZ2367QI and the 25 A, AOZ2368QI make the design of such converters simple by integrating AOS’ advanced MOSFET technology to power next generation high-end systems. AOS’ unique packaging expertise also provides these converters better thermal management capabilities to ensure the system runs in a stable and robust environment. AOZ2367QI Efficiency vs. Load Current. The new devices have all the integration advantages of the EZBuck family of products. Combining AOS’ benchmark MOSFET technology with advanced packaging technology enables high-performance and high-converting efficiency DC/DC regulators in a compact footprint. AOS’ performance MOSFETs enable high efficiency over the entire load range with low on resistance in the range of 1 mΩ to 4 mΩ, and light-load efficiency that gets a further boost with an optional pulse frequency mode (PFM). The 20 A and 25 A devices are all available in a footprint compatible QFN 5 × 5 mm package allowing designers an easy upgrade path as power requirements increase. The devices operate over a wide input voltage range of 4.5 V to 24 V with output voltages adjustable down to 0.6 V. The proprietary COT architecture provides ultra-fast load transient response performance and allows a stable and low voltage ripple operation with small size ceramic capacitors. Competing solutions require several external components when using all ceramic capacitors and needs to generate a larger output ripple voltage to stabilize the circuit. Additionally, the input feed forward feature provides a constant switching frequency over the entire input voltage range, which further alleviates noise concerns for designers. The AOZ2367QI and AOZ2368QI are immediately available in production quantities with a lead-time of 12 weeks. The unit price for 1,000 pieces is $2.529 for the AOZ2367QI and $2.948 for the AOZ2368QI.